That is the famous, obvious side of Instagram life, like a TV or a glossy magazine cover of the early 2000s. But there is, after all, a secret reverse side open only to initiates. For example, to SMM managers or girls from the PR department. The director, actress, and cameraman, even individually, know the movie better than the viewer. Compared with their fans, instastars are putting in not less, or even more, effort in order to remain in the field of urgency; to be fashionable, famous, recognizable; to increase the relevance or rise it twice as fast. In such a serious matter there are no boundaries, as there is no limit to increasing sales. A coolly designed page on Instagram, which many people have followed, will be able to sell not 5, but 125 handmade boxes, or 125 thousand. You just need to reach out to the follower. Most users expect from an instablogger a hearty, simple relationship, a light joke, or even a profitable commercial offer. 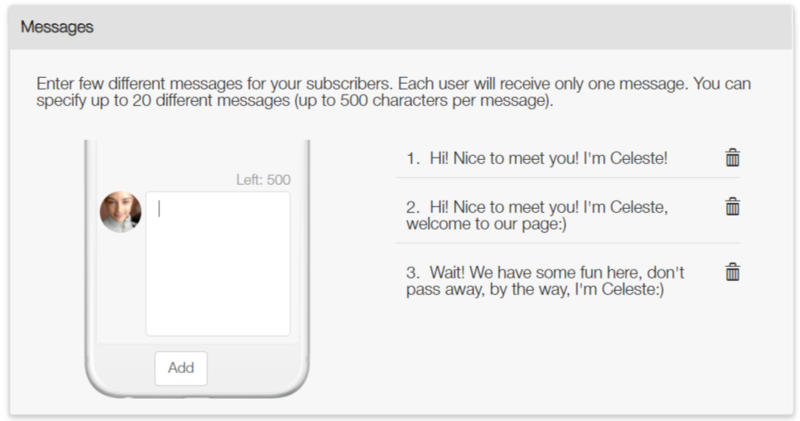 Zen-promo service has an AutoDirect — a function of automatically sending pre-prepared messages to each new follower. And, no matter what the opinions have the brutal Instagram algorithms, this is not a spam. The AutoDirect is only helping to bring the blogger’s world closer to the world of an ordinary user, giving a popular (or striving for popularity) person a technical opportunity to personalize communication with the audience. It gives readers a sense of belonging, informs about the latest discounts after all. Direct messages are a very simple and very effective way to say hello, offer a potential buyer a discount or have a personal conversation with an interested user. In real life, acquaintances greet each other in person: they are shaking hands, hugging, saying pleasant words. A good blogger wants to be closer to his followers, and this feeling is mutual. And, although, it’s still far from virtual handshakes, web technologies are quite capable of making every virtual fan happy with warm words. For example, each of the 17.1 thousand people. Followers are craving attention. The question is whether they will get it. Link an Instagram page with Zen-promo account for promotion (you can promote several pages!). Prepare typical messages that will go to new readers. You can write up to twenty template messages. They will be sent in random order. 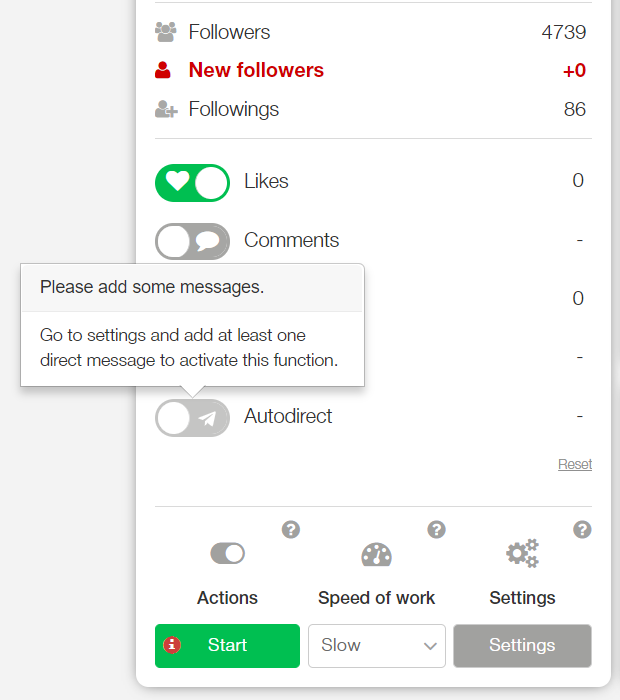 Zen-promo has provided the ability to install a filter: if you wish, you can make it so that auto-messages will go only to Russian-speaking readers with a certain number of followers, subscriptions or posts. More detailed instructions on how to set up auto-posts on Instagram Direct. Pictures are attached. automatically send messages to Direct. In order to enable the “AutoDirect” function, you must first write typical messages. This can be done by going to the settings menu, which is hidden behind the gear icon. The settings menu is very extensive. 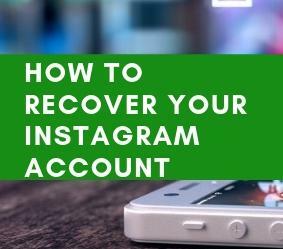 Each option is important and affects the promotion of your account on Instagram. However, the topic of this article is to configure the AutoDirect. Therefore, you need to click on the "AutoDirect" button. It will take the user to the very end of the page. the right one is responsible for the text of the template messages intended for automatic distribution. It doesn't matter in which order to carry out the configuration. For definiteness, firstly, we'll explain how to write template messages. The text of a message that you need to add to the number of template ones should be entered in the white field. 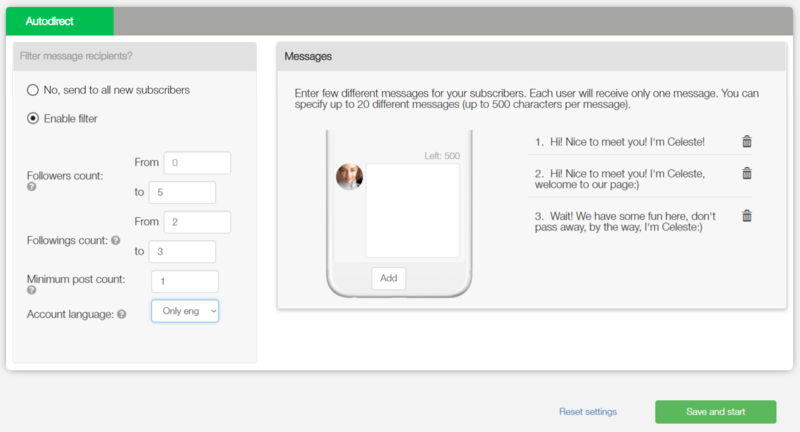 The maximum number of template messages in the database is twenty and the maximum number of characters per message is 500 (spaces are taken into account). 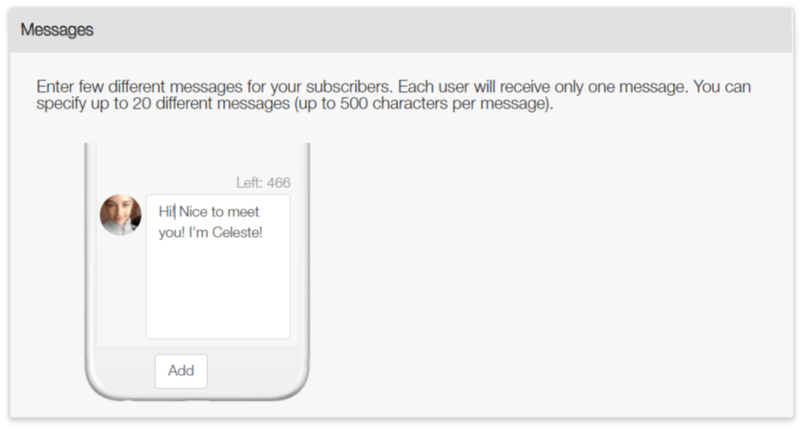 New followers receive one template message and the system decides which one they'll receive randomly. Theoretically, a new reader can get any text from the prepared ones. After entering a message in the field, click on the "Add" button. Now the text is in the database. to tell more about yourself, your account, Instagram life or even Instagram philosophy — a great chance to hook a new user with a non-trivial idea. The first impression is always the most important, on its basis, a long-term attitude is formed not only towards the person but also towards the brand and the Instagram page. In principle, at this step, the AutoDirect could be enabled. But the full setup isn't complete yet. 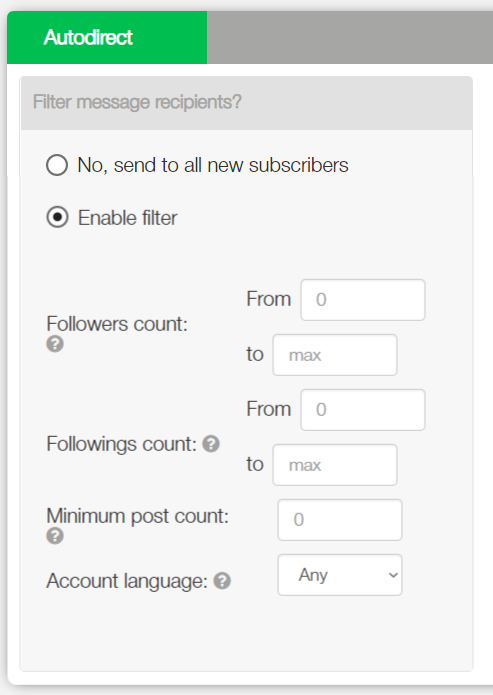 configured account language (the filter has two modes — send an auto mailing to Russian users only or send to all). Of course, Zen-promo user can and must set his own preferences ​​for the restrictive fields. Or don't configure any. As a result, the “AutoDirect” section of the settings menu will take about a similar look. Next, you need to rewind the page up and click on the "AutoDirect" slider. 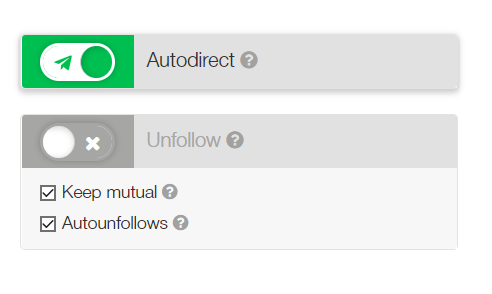 This will enable the automatic messaging mode for new followers. Then you should save the changes. In order to do this, click on the corresponding green button in the settings menu. And... wait for the first results! Both new readers have received a greeting. Unfortunately or, maybe, fortunately, Instagram uses special algorithms that ban suspiciously active pages. In Zen-promo, everyone knows about promoting accounts and about algorithms too. It makes more sense to prepare several different templates. Multiple posts of the same type can be classified as spam. Zen-promo supports up to 20 sample texts with a maximum capacity of 500 characters with spaces. Each reader deals with only one of the texts. Perhaps, the author's page follows more than 50 people per day. A sharp increase in the activity of sending messages to Direct can be regarded as suspicious behavior. A good tactic for the first few days is to prepare a filter so that no more than 50 messages are sent per day. In any case, you shouldn't send more than 200 messages per day, regardless of the age of the account or the number of readers. Bans are not conducted manually but programmatically. There are certain formulas that calculate and compare user actions taken on the Instagram interface. Everything counts: from sudden popularity and spam to the origin of IP.